"Don't let your dreams be dreams." 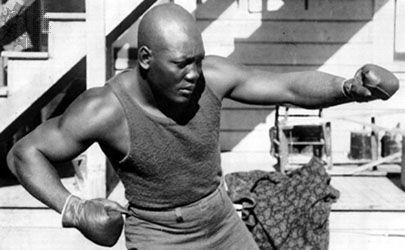 I've always wanted to sculpt a boxer ever since I started ceramic sculpting but could not come up with a concept that worked - until I happened to come across a photo of Jack Johnson, the world's first African American heavy weight boxing champion, holding an air jab pose while training. John Arthur Johnson is considered one of the greatest heavyweight champions of all time, and his prowess in the boxing ring were legendary and foreshadowed techniques, athleticism, and flair that are ordinary by today's standards but were ground breaking during his time. By all accounts, he lived a remarkable life on his own terms in the face of racial prejudice and prevalent bigotry. While this piece is meant to portray a nameless prize fighter, it is inspired by Jack Johnson and based on that photo of him showing off his jab. My thanks again to the Ceramic Art Studio and Shop.